/ The Musical Box: UK & Ireland Tour 2020! The Musical Box: UK & Ireland Tour 2020! 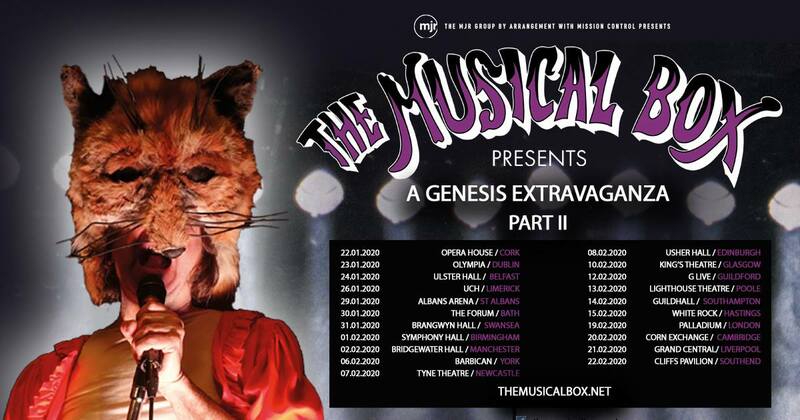 Canadian Genesis specialists The Musical Box have premiered their Genesis Extravaganza show last year in Europe. They are currently touring the States and Canada an will be back in Europe for more dates this fall - called A Genesis Extravaganza II. Yesterday, the band has announced another full UK tour (plus Ireland for the first time). 21 shows are scheduled for Ireland and the UK in January and February 2020. Tickets for the UK go on sale on 18th March and Irish tickets will be available on 19th. A review of their shows in Luxembourg and Saarbrücken in late 2018 is available at this link. See our tour dates page for full details. Ali Ferguson's first soloalbum is now available in digital formats.